The Cleveland Browns are off to a great start by their standards, but it could be so much better. Going into their Week 5 game in each of the last two seasons, the Cleveland Browns sat at 0-4. But this season, going into their Week 5 game at home against the Baltimore Ravens, Cleveland is in a much better position, sitting with a 1-2-1 record. But realistically, the Browns could have flipped the script even more drastically this year. Instead of going 0-4 into Week 5 for a third straight season, they could have been sitting on a 4-0 record. 1-2-1 isn’t as bad as 0-4, but it’s not also as good as 4-0. While the jump from 1-2-1 to 4-0 is a long one, the scenario where the Browns are unbeaten after four weeks isn’t difficult to fathom. 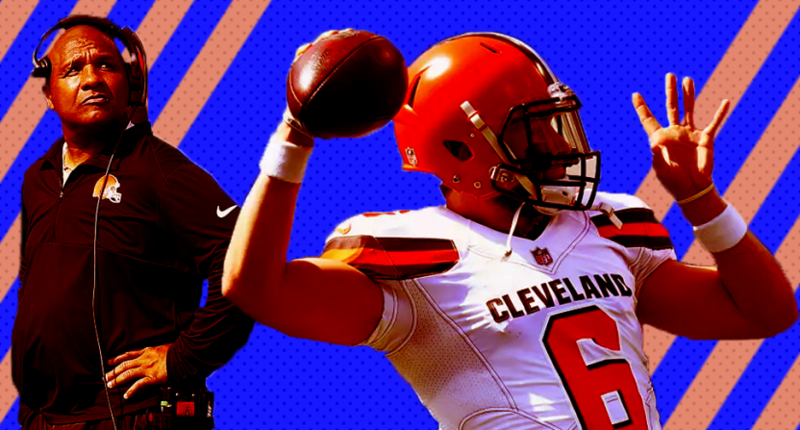 Let’s look back at the three non-victories for the Browns this year and figure out just how Cleveland could have won each of those three games. The Browns didn’t lose for the first time in nearly two years after opening the season the season with a tie, but it should’ve been a win. There were multiple instances late in the game where Cleveland should’ve either pulled away or sealed their victory. First came the collapse in the fourth quarter. As the final 15 minutes of the game began, Cleveland led 21-7 at home and looked like they might start 1-0 with a big win over their division rival. But the Browns’ defense couldn’t hold on, and the Steelers forced overtime. Then came the heartbreak in OT. After Pittsburgh missed a 42-yard field-goal with 1:44 left, Cleveland had a field goal opportunity of its own. With nine seconds left in OT, Zane Gonzalez lined up for the 43-yard game-winning field goal. Sadly for Browns fans, the kick was blocked and the game ended in a tie. Another week, another loss that could’ve been a win for the Browns. Cleveland didn’t blow this one as much as they did their Week 1 tie, but they easily could’ve won it. Let’s start off with their lead at the start of the fourth. The Browns led 12-3,and had two good opportunities late in the fourth to ice the game, but blew both. While the team as a whole struggled, it was really the embattled kicker Gonzalez who couldn’t seal the deal for Cleveland in this one. After a drive that ended in a 47-yard touchdown pass to Antonio Callaway on fourth down, Gonzalez lined up for the extra point to make it 19-18 and put pressure on Drew Brees and the Saints. Unfortunately for Gonzalez, who would be cut the day after the loss, he missed his second extra point of the game to keep it at 18-18. The Saints then drove down the field and kicked a field goal of their own to take a 21-18 lead. After quickly moving into field goal range, Gonzalez lined up for a 52-yard field goal that would have sent the game into overtime. However, if Gonzalez hit one of his earlier missed extra points, this 52-yarder wouldn’t have been for a tie – it would have clinched a win for Cleveland. Instead, just like he did with the extra points, Gonzalez missed, and the Browns lost once again. Nothing to see here, the Browns won a game! The Browns had multiple chances to put away this game, but they kept letting the Raiders claw their way back. Cleveland led 28-14 in the third and 42-34 with just over a minute left in the fourth quarter, but couldn’t put Oakland away. Part of the reason why the Browns lost was rookie quarterback Baker Mayfield, who gave the ball away four times in his first NFL start. Another key issue was a late-game replay review that went against the Browns. With 1:41 left in the game and a one score lead, Carlos Hyde rushed for a first down to seemingly end the game in favor of Cleveland, who could’ve run the clock out. But after a replay review, it was determined Hyde was short of the first down and the Browns had to punt. That ultimately led to the Raiders’ game-tying drive and soon thereafter, overtime. The Raiders missed a field goal on their first OT possession, the Browns went three and out, and Oakland was true with their second field goal try to win the game. It’s unfortunate that Cleveland has come as close as it has to a 4-0 start. Through four games, they’re 1-2-1, and have been outscored by a total of two points on the season, and all of their games have been decided by one score. If the Browns could’ve pulled wins out of the fire in their draw and two losses and started 4-0, following a winless stretch since a 20-17 victory on December 24th, 2016 against the then San Diego Chargers, it would be arguably the biggest storyline in sports right now. Think of it this way: coming into this season, the Browns had won a total of four games in their past three seasons. Imagine if they had four wins in the first four weeks of the 2018 season. That arguably would’ve been the greatest turnaround in sports history. Instead, we have to wonder what might have been, and wonder when, not if, the next win is coming. David is a writer for The Comeback. He enjoyed two Men's Basketball Final Four trips for Syracuse before graduating in 2016. If The Office or Game of Thrones is on TV, David will be watching. The QB bust rate has plummeted in recent years, but are we due for a spike?